We wanted to make you aware of a bill that is making its way through the general assembly and is poised for passage as early as next week. That bill is SB3, also known as the SBDM bill. require school council authority to be transferred to the superintendent if a school is identified for comprehensive support and improvement. Contact your house representative and share with them personal accounts of how an SBDM operates, and help them visualize how some of these proposed changes could play out in actuality. Reach out to legislators across the state and help them understand differences between rural and urban districts, and how altering SBDM powers in one district could cause unintended consequences they may not be considering in another. Use this one-click link to send an email to all of House Education Committee members at the same time. The email addresses and twitter handles for legislators serving on the house education committee are also listed below. Click here to send a Tweet to legislators on the House Education Committee! Sample text w/handles included. Or write your own! These changes to our current SBDM laws, if passed this session, could go into effect right away, and your powers as an SBDM member could be greatly reduced. Today is KASC’s first in a series of weekly Legislative emails to keep you informed about relevant education bills while the General Assembly is at work. You will also receive information when KASC’s takes a position on issues that directly impact the ability of SBDM councils to provide the best quality learning experience. The 2019 Regular Session of the Kentucky General Assembly is a “short session” since the legislature meets for only 30 days in odd-numbered years. Throughout the session, KASC will be tracking numerous bills that have direct impact on teaching and learning for teachers, parents, principals, students, and councils. The first challenge is already here with Senate Bill (SB) 3, which will drastically alter School Based Decision Making in Kentucky. SB 3 is an attempt to remove the local teacher and parent voices from a school and replace with decisions by the superintendent and school board. Schools are unique and show different strengths and specific challenges; the SBDM process allows school-level decisions to be made by the people who know the students best—the principal, teachers, and parents. There is ample evidence that in the past 27 years, since we have instituted SBDM, our student achievement has greatly improved. Our SBDM system is working, and it will not benefit our schools to revert to a system where school decisions are politicized and made from the top down. SB 3 is fast-tracked this session. The bill was filed on the first day of the session — Tuesday, January 8; approved by the Senate Education Committee on Thursday, January 10; and before lunch on Friday, January 11, the bill passed the Senate. KASC spoke before the Senate Education Committee to vehemently oppose this bill. Next step: The bill will head to the House and must first have a hearing before the House Education Committee. Our hope is that the House Education Committee will NOT hear this bill that will severely decrease School Based Decision Making and remove a proven process to improve Kentucky schools at the most local of levels. Grants the superintendent the sole authority to fill principal vacancies. The current principal selection system is extremely successful, allowing principal selection to be a joint decision with the superintendent and SBDM members. Evaluations of Kentucky principals show that the vast majority of principals are ranked exemplary or accomplished, and we do not need to amend this provision. Provides that SBDM policies shall be consistent with district policies; thus, school boards could dictate what policies govern individual schools and second guess school councils. SBDM has been successful because it is recognized that all schools and students are not the same and the one-size-fits-all bureaucratic processes do not lead to students reaching higher levels. Removes one teacher member from the school council. Thus, the school council membership configuration will be 1 principal:2 teachers:2 parents. This change was proposed without consulting KASC, KEA, or KYPTA. SB3 also allows a teacher to be transferred while on the council. This protection from being transferred while serving on the council was added years ago to address threats and intimidation used to try to control SBDM teachers. KASC is asking you to contact House Education committee members. Our House Education Committee members need to understand that councils are important contributors to school success; that teachers, principals, and parents deserve a strong voice in schools; and that it makes sense to allow decisions to be made by educators and families who know the challenges that schools face and who see students and families every day. * I’m against SB 3 because I support school councils. 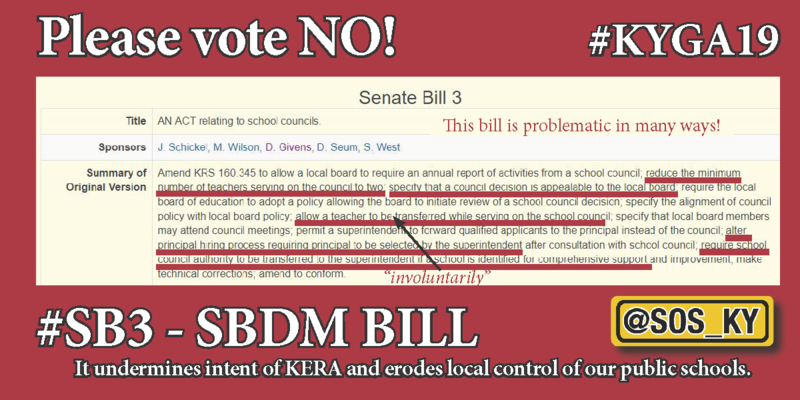 * I oppose SB 3 because school councils are effective and deserve more respect. * I’m against SB 3. School councils give everyone a voice. Click here to view the bill: http://www.lrc.ky.gov/record/19RS/sb3.html. Please feel free to email us at moderator@saveourschoolsky.org or call 502-565-8397 if you have any questions or require additional information.